As America confronts its ongoing struggle with racial and ethnic prejudice, the internment scandal is being re-examined. This fall, George Takei (best known as Star Trek’s Mr. Sulu) brings the story of his own internment as a child to Broadway in the musical Allegiance. 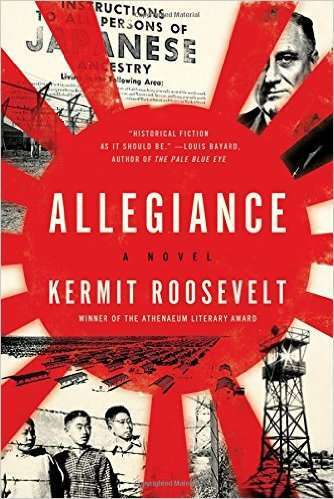 And now, a novel of the same name is being released by author Kermit Roosevelt III (great-great-grandson of President Theodore Roosevelt, and cousin of Franklin D. Roosevelt, the president who signed the internment order). Michael Ruscoe: You’re in a unique position of being related to a central figure of this historical novel. How did that familial connection affect your writing of Allegiance? Kermit Roosevelt: It affected the writing in a couple of ways. I feel affection for FDR—I think he was a great president. And part of the point of telling this story was to show that even good people can do bad things, that you can’t always trust someone because they seem like the right sort of person… I felt like saying this about a member of my family might be an effective way to make the point. More generally, I think that my ancestors have given me probably a greater than typical sense of identification with the government. I think we should all identify with the government to some extent. It’s a democracy; the government acts in our name, and we bear some responsibility for what it does. But I did, and still do, probably feel that identification a little more. Which made it especially painful for me to see the government doing things I thought were misguided, doing things I thought were wrong.